PNNL: Science &amp; Engineering - What about Phlox? Longleaf phlox is common and widespread in the lower Columbia Basin. Some spring day as you walk across or drive through the lower Columbia Basin you may see small, pink-petaled flowers blooming in the shrub-steppe. You're probably looking at longleaf phlox, one of three low-growing native perennial species of phlox in the Tri-Cities area. Phlox is a Greek word meaning "flame." Lewis and Clark are reported to have noted this plant in their journals describing their explorations of the Columbia Basin in 1805 and 1806. What does phlox look like? Longleaf phlox usually has pink blossoms, though the color may vary from pink to nearly purple. The flower has five petals. Its long, needle-like leaves are narrow and sometimes can be found winding around the limbs of sagebrush. Longleaf phlox is common and widespread mostly in sandy and loamy soils of the shrub-steppe. Longleaf phlox is common locally in undisturbed areas such as the slopes of Badger Mountain and the Horse Heaven Hills. Hood's phlox generally has a white flower with five petals. It forms low-growing mats and is found in rocky soil on the crests of ridges such as Rattlesnake Ridge, Badger Mountain, the Saddle Mountains, and Horse Heaven Hills. It has very small narrow leaves. Showy phlox also is pink or white but looks slightly different than the other two species. Its five petals appear notched on the end instead of rounded. Locally, showy phlox has been found in moist canyons of the Rattlesnake Hills and Umtanum Ridge near Priest Rapids. 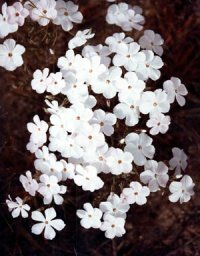 Other places you can see native phlox in the shrub-steppe ecosystem include Wilson Creek in Lincoln County, Selah Butte, along Umtanum Ridge in Lincoln County, Rock Island Creek on the slopes of Badger Mountain in Douglas County, and Fishtrap Lake and Hog Lake in Spokane County. Phlox survives in the shrub-steppe by growing and flowering during the wettest season of the year and going to seed in the hot, dry summer. Its compact size and narrow leaves protect it from the sun's heat and helps it conserve water. In areas of the shrub-steppe that have been disturbed, phlox has been replaced by invasive species such as fiddleneck tarweed, Russian thistle, knapweed, cheatgrass, and tumblemustard. Why is phlox so important to the shrub-steppe ecosystem? Phlox helps provide erosion control and contributes to the natural and unique beauty of the shrub-steppe. Butterflies and moths depend on phlox for its nectar. Only a long-tongued insect can reach the nectar concealed at the base of the plant's floral tube. Keep in mind this fact sheet is intended to be used only as background information to support your effort to encourage inquiry-based science, which parallels the way scientists uncover knowledge and solve problems. 1. Gather some native phlox seed, and plant it in pots. Seed may be available at a local nursery or through the local native plant society. Try conducting an experiment. Plant the seeds in different types of soil (sand, potting soil, peat moss, clay, loam). Keep records of the types of soil used in each container. Recreate different growing climates/conditions in each pot. Keep records of the amount of water used in each pot. For best comparisons, you will want to use a control group across the soil types that receives exactly the same amount of water. Under which water and soil conditions did the phlox grow best? Have groups make charts of plant growth in terms of drawings and actual measurements. Buy some commercially propagated phlox seed from a nursery and compare it to the native phlox seed. Under which conditions did the non-native seed perform best? 2. Study the root system of a native phlox and compare it to the root system of a commercially grown phlox plant that is similar. What is the same about each plant? What is different about each plant? Which one would survive best under hot, dry conditions, and why? Compare and contrast flower shape, color, size, and brightness. Compare and contrast the number, size, and shape of leaves. Make a chart to illustrate the differences between the two plants. 3. Take a hike in the Horse Heaven Hills. Mark off an area with string and measuring tape (approximately 50 feet by 50 feet). Have students identify and count the number of phlox plants they see. Have them develop a chart to keep track of other types and numbers of plants sited. Next go to a vacant lot or abandoned field that has been disturbed. Repeat the activity. Compare and contrast number of phlox plants sited in each area. Have students discuss reasons for the difference of the abundance of the plant in the two locations. Arid Lands Handbook, 2000. Georganne O'Connor and Karen Wieda, editors, Pacific Northwest National Laboratory, Richland, Washington. Sagebrush Country: A Wildflower Sanctuary, 1992. Ronald J. Taylor, Mountain Press Publishing Company, Missoula, Montana. Shrub-Steppe Seasons: A Natural History of the Mid-Columbia Basin, 1997. Lee Rogers, Pacific Northwest National Laboratory, Tri-Cities, Washington. Washington Watchable Wildflowers: A Columbia Basin Guide, 1997. Bureau of Land Management, Wenatchee, Washington. Initial development and printing was funded by the Partnership for Arid Land Stewardship (PALS). Project Manager: Karen Wieda. Written by: Suzie Murphy, Richland School District. Series Editor: Georganne O'Connor; Design: WinSome Design.